Josie's Juice: Road Safety Campaigns Australia: Very Graphic. Don't Drink and Drive. Road Safety Campaigns Australia: Very Graphic. Don't Drink and Drive. I saw this on my friend's Facebook page and very reluctantly clicked. Thing is, I knew it would have a huge impact, I'd read the 'very graphic' warning, and knew I should watch it once, and once only... so I could post about it authentically here. It affects me so deeply because my father was killed in a car accident when I was age 13, and I have never and will never recover from his death. A man killed him on a Sunday morning, on December 1, 1985. It was 7am. On our street. The man was fatigued. I believe he was still drunk and hungover. Our family was utterly torn apart and never put back together properly. Ever. Ever. The scenes in this - many I recall from road safety campaigns over the years - are all too real. The police coming to our door. Us going to the hospital and getting that dreaded news. And collapsing. And wailing. The identifying the body at the morgue. Attending my first funeral - my father's. The life-altering and deeply distressing aftermath. It all happened. In real life. In my life. Please share this post with everyone you are connected with on social media (and even those who are not on Facebook). It's crucial viewing, with an urgent reminder: don't drink and drive, don't drive fatigued, don't text or talk on the mobile phone and drive. Please share. And heed the warning. Thanks. 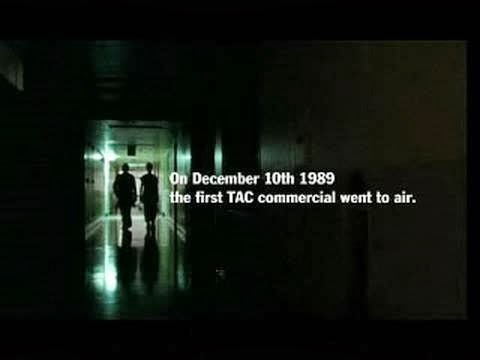 "On December 10th 1989 the first TAC commercial went to air. In that year the road toll was 776; by last year 2008 it had fallen to 303. A five minute retrospective of the road safety campaigns produced by the TAC over the last 20 years has been compiled. The montage features iconic scenes and images from commercials that have helped change they way we drive, all edited to the moving song Everybody Hurts by REM. This campaign is a chance to revisit some of the images that have been engraved on our memories, remember the many thousands of people who have been affected by road trauma and remind us all that for everyones sake; please, drive safely. Transport Accident Commission Victoria."